Located along the Appalachian Trail on the border of TN and NC, Big Bald offers 360-degree panoramic views of the Smokies, Mount Mitchell and Unaka Mountain. Ridge upon ridge can be seen from this 5,516 foot summit -- if it weren't so hazy on the day we visited, I'd be able to show you that Big Bald offers some of the best views you'll find of the Appalachian Mountains anywhere. You can hike in on the AT, but there are no public access points nearby (if you know of any please let us know!). The best and easiest way to see the sights at Big Bald is to arrive using the access road located within the gated community of Wolf Laurel on the NC side. The security guard at the gate was very helpful in letting us in and pointing the way. We walked first up to Big Stamp, an adjacent bald, and enjoyed the views. The photo above shows Duke on the Appalachian Trail leading the way to Big Bald in the distance (click photos to enlarge). 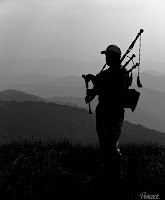 As we made our way to Big Bald we heard the unmistakable sound of bagpipes wafting over the hills. What a perfect place to hear bagpipes! When we arrived on top of the bald, we met Brian Ogburn (right) and his wife who were visiting Wolf Laurel from Winnsboro, South Carolina. Thankfully he brought his bagpipes to serenade us lucky hikers. Thanks, Brian, for sharing your talent and for making our visit to Big Bald unforgettable. Directions: Take exit 3 off of I-26 (on the NC side) and follow the signs to Wolf Laurel Resort. Once at the gate proceed straight on Wolf Laurel Road for 1.7 miles, turn left on Big Bald Road and continue up the mountain for 2 more miles (the last 1.3 miles will be gravel). Park at the gate and proceed on foot for 1/4 mile. The gravel road will intersect with the AT, to the right is Big Stamp, and to the left is Big Bald. Update 5/30/09 - Drove up to the gate at Wolf Laurel and was turned away by a security guard who said that the owners of this private property were insisting that visitors not be permitted on the property under any circumstance. So I guess if you want to see this natural treasure, you need to hike in 6.5 miles (one way) from Sam's Gap on the AT. I wish they'd come up with a system where, on certain days, between certain times, license plates are written down and a small fee paid -- wouldn't that keep out the riffraff? Do they allow access to big bald for hikers through the wolf laurel or is it for the residents only? On the drive to Wolf Laurel, I also had doubts about getting in. We aren't residents -- but they let us right in. When we drove up to the gate, we simply asked if we could drive up to Big Bald, he jotted down our license plate and on we went. I really should have asked what their official policy is on this. If you go, please let us know what your experience was like. Thanks! I am a year round resident of Wolf Laurel. The "official policy" is that non-residents are not allowed access too Big Bald through the gate. (It really depends on which guard is on duty but they have clamped down recently). However, some of us are working to change that. As of this week we have filed a lawsuit against Wolf Laurel relating to many of their elitist policies and regulations including their phony covenents. I operate a B&B a couple of miles down the road from the Big Bald gate and would welcome hikers with comfortable beds and hearty, delicious food. My husband and I've been guests several times at this B & B. it's fabulous, the food is incredible, and the views are wonderful. Highly recommend it! Maybe im wrong here but its my understanding that big bald belongs to pisgah/cherokee national forests. The resort only controls the access road to the forest boundary. Makes one wonder do they also turn away the forest service when they need to drive to big bald for any maintenace reasons? How about the bird banding station set up there in the fall, one wonders if that too will be denied access. We only refuse entrance to the Bald through a private gated community (it is private land). This is not unusual. Anyplace you live you yourself wouldn't allow anyone to walk across your property to access a lake, etc. You can still access the Bald and the Appalachian Trail, just not through Wolf Laurel. We do allow bird banders and the Forestry Service, as well as emergency responders in. Bird banders can get special clearance. Actually I would allow people to walk across my property if they wanted to visit a lake, waterfall, bald, etc. as long as they did not bother my or destroy anything. Yes you can access it from Sam's Gap but not everyone has the time or ability to hike 13 miles in one day. Why do people believe they have the "right" to see every natural wonder without making an effort? If you don't have the time or ability to hike 13 miles (or less from Street Gap), then you shouldn't get to see the spectacular view from Big Bald. There are plenty of great places to see spectacular views without any effort. For example, go to Mount Mitchell and see all the people who drove up near the top and strolled in flip flops. There should be places in our country where it actually takes some effort to get there. So to enjoy a great view, we either need the money to buy our way into a resort, or 7 hours of free time to make the hike. No one is asking to walk through anyone's yard. It's a matter of driving down a street used by hundreds of people to get access to walk up the last bit to the top of the mountain. It's sad that the homeowners are greedily hoarding this access point for themselves. It's a good thing that some smart forefathers created the National Parks system or every place would be like this. You can access without going through Wolf Laurel- just keep going on the road past Wolf Laurel until it nearly dead ends- there is a sign that points you to the AT but beware- the road is EXTREMELY ROUGH and washed out- 4 WD only. Proceed to the end of the road and take the trail to the right to access Big Bald- to the left will take you to Sam's Gap. 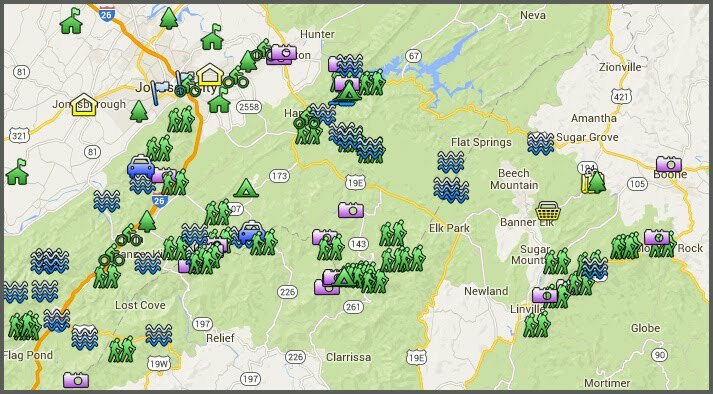 I will stick with Max Patch, but would like to find some more accessible family hikes. Anyone know of property owners in Wolf Laurel close to the AT that allows parking for backpackers. Free or for a fee. Would like to make it to Big Bald with small children. Where? Specifics would be wonderful. Haven't found it but would like to know. I keep hiking the 13 miles, which is great, but sometimes have out of town visitors and not enough time for the hike. Pretty sure you are referring to the one at the end of the road (Big Bald Road?) that runs right through Wolf Laurel. To reach that parking lot, you have to go through the guard and gate, which seems to be impossible for non-residents. Was just there this weekend. It is beautiful, It will stay that way as long as it is a hike in destination. There is no trash, cigarette butts , etc. If it were easy to get to it would be spoiled. So sorry, easy access means little respect fopr the destination...... I wish people could visit beautiful places and leave them that way. But unfortunately, they dont. I was just there this morning. A more beautiful site you'll not find. I saw a couple dozen hikers up there. It was gorgeous and quiet and serene and about as close to G-d as one could imagine! I would love to go back up there. I was there in the late 60's and early 70's surveying all the land around it. Talk about unspoiled it was beautiful and like another post stated as close to God as one could get in that neck of the woods. I am now 57 years old and have had major back surgery (in Germany) and don't think I could make that hike. Does anyone know if that access (extremely rough road) is doable in a stock Grand Cherokee 4wd?